Reading is fundamental. A student’s overall academic success is dependent on his/her ability to read. Even though reading in itself is an academic subject, it is an essential part of other academic subjects. For example, each week Griffin’s first grade math homework has story problems that he has to know how to READ in order to solve. Likewise, as students advance through school years, the bulk of their learning in science and social studies will depend on their READING capabilities. I found a great resource in the IRRC Family Resources Collection that helps connect science and reading skills. “Making Predictions” is an article that shares with parents how to help their children understand that predicting is a skill that can be used in reading as well as science. The article shares how predicting is one way for children to monitor their reading. By making a prediction and reading on to see if it was correct is a way for students to understand what they are reading. The article also shares how scientists use predicting as part of a hypothesis, or question, when conducting experiments. Predicting is a reading skill that my children and I have been working on during our nightly bedtime stories. Griffin and Ryan usually make predictions that are relevant to what's going on in the story. “Making Predictions” reminds parents that a child’s predictions should be “good and fairly accurate” to demonstrate they understand what they are reading. I tell my children their predictions should make sense to what we are reading, but they don’t always have to be correct. We talk about how it is most important to understand why a prediction is correct or incorrect—how that it shows they understand the story. What I like most about “Making Predictions” is that it gives two suggested activities for families to connect the predicting skill with science. These activities are designed for families to do at home to help children connect reading and science. We had a great time doing them. My kids had a great time with this activity. The article suggests thinking of a question the kids can predict, or guess the answer to and then survey family members about. The article suggests surveying family members about a particular favorite, like which ice cream flavor they like. We eat a lot of ice cream in our family, so I thought this question was perfect. I had the kids list a few ice cream flavors and had Griffin record our list. Then, I had them guess who would like which flavors. Next, we surveyed family members. The data ended up being very similar to Griffin’s predictions, but Ryan’s were pretty off base—she thought everyone would like strawberry the best as she does. This activity was a great way to reinforce making predictions and seeing if they were correct. In addition, we were able to practice writing, tallying, and graphing. The article suggests that estimation is very similar to making predictions. You can make a good guess about how many minutes you can walk a mile and then go test it out to see if your estimation was correct, similar to monitoring your reading to see if your predictions are close to accurate. The article offers some suggested estimation questions that would be fun. We will try some of them out soon, but decided to do our own last night. Ryan was playing with cardboard bricks and so I decided to ask her if she thought she could stack all of the tall ones together. She has eight of them and they are each about one foot long. 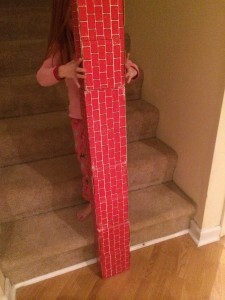 I asked her to estimate how many she thought she could stack and she said, “All eight!” (Of course she did). We started stacking and by about 5 blocks the stack started swaying a little. Giggling the entire time, she was able to stack 6 blocks successfully. We discussed how her estimation wasn’t correct, but that it was close. What I liked best about this activity was that it provided a great opportunity for us to have a conversation. She then asked if we should try to start a new stack next to the stairs to see if they would help keep the stack stable. We tried it and only made it to 3 blocks. Ryan guessed that the first block was leaning on the step and making the entire stack lean. Next we tried the same activity with smaller connecting blocks. We got to 29 before the stack fell. I know her kindergarten teacher would also be happy with the counting practice Ryan was getting. Finally, we ended the activity with estimating the number of marshmallows they could fit in a small container. The kids were quite motivated with this challenge. 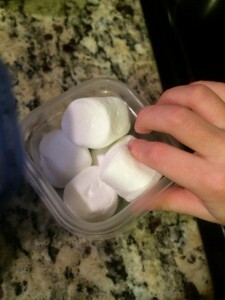 They wanted to fit as many marshmallows they could in the small container, because I had told them they could eat all they could fit into it. They were surprisingly accurate with this, mainly because they were cramming all 6 marshmallows in the container. Nevertheless, it was a fun (and yummy) way to end this science/reading skill activity. This activity was a great way to connect science and reading. Not only did we discuss making predictions, but also had a great conversation with new vocabulary. Search "Making Predictions" in the Collection to learn more about this fun activity.